AJMAL FOUNDATION provides financial support to the meritorious, economically backward students who are pursuing or wish to peruse Medical and Para Medical, Technical, Engineering, Management, Law, MCA or other such Courses. This will enable them to become successful professionals. Apart from this, it will enable them to earn their livelihood, educate their children and support their families. Scholarships are provided to the students who are pursuing their intermediate studies too. It will be a very effective step to promote and empower the minority communities to contribute towards the development of the nation. Meritorious students from across the country will be shortlisted from economically weaker sections of the minority community especially whose family income is not more than INR 1, 50,000 per annum. While selecting the students, care will be taken to cover different educational fields so that these students can contribute towards the growth and development of the country equally in all the relevant areas. Education is the backbone of any nation. No nation can progress without proper and uniform education of all the segments of the society.The representation of the poorer sections of the society in Government and other sectors are very discouraging. Naturally, in all competitive examinations, these masses can hardly succeed and get access to blue collar jobs. Most importantly, due to poor economic condition and access, the students find it difficult to continue their higher education or special coaching. Assam has a comparatively satisfactory literacy rate of 73.18%, the district difference between the highest (Kamrup Metropolitan; 88.71%) and the lowest (Dhubri; 58.34%), was staggering 30 percentage point. When compared, the percentages of Muslim and Hindu communities in these two district, it is found that district with low literacy rate is inhabited largely by Muslim community people and vice-versa.There is a wide variation in the participation in higher education as we move from ST, SC, OBC and others. It varies from 6.26% in the case of ST to 10.52% in the case of SC, 14.27% in the case of OBC and 29.56% in the case of General.Only 6.3% of Muslim students are studying in Indian Institute of Management (IIM) which is 1.32% of total IIM students. The percentage of Muslim students studying in Indian Institute of Technologies (IIT), MBA and Medical Sciences is only 3.29%, 1% and 4 % respectively (Sachar Committee, November, 2006). As for higher education, in the report titled, “Six Years after Sachar”, (Abusaleh Shariff – January, 2013), the participation of Muslims in higher education has been analyzed. It is found that Muslim OBCs are much behind the Hindu OBCs, SCs and STs. Even the general category of Muslims is far behind SCs and STs. It has been noted that the general category of Muslims have seen 1.5% decline between 2004-05 and 2009-10. The study has also noted that there has been massive increase in the participation of students in higher education in the age group of 17-29, in general. In 2004-05, the percentage of participation in this age group in higher education was 6 % and it has risen to 11% in 2009-10. However, the Muslim community has not been able to get the benefit of higher education despite the Sachar Committee Report and some steps taken by the Government to address the situation. It is strongly felt that there is a need to take concrete steps to improve the participation of Muslims in higher education by making it mandatory for the Universities, Institutions and Colleges to try to achieve diversity in their student population. Scholarships, fee waivers and other facilities like hostels etc. given to SC students also need to be made available to Muslim students. The implementation is a vital phase where visions and plans become a reality. This is the logical execution of plans after a thorough evaluation of all the factors associated with the project. A Project Implementation Committee will be set up consisting of the core members of the organization. After a confirmation of funds from the donor organization, our team will start executing the plan that was formed during the project preparation. 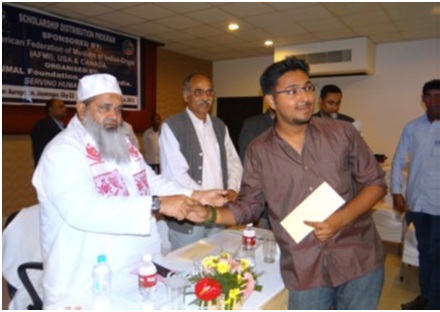 AJMAL FOUNDATION receives applications from poor meritorious students from across the state of Assam and outside. On confirmation of the fund and number of beneficiaries, our organization shortlists the students on the basis of their merit. Thereafter, the beneficiaries are called along with their legal guardian in a suitable place and location and were briefed about the terms and conditions of the project. Thereafter, the scholarship is provided in the presence of the Honorable Trustees of AJMAL FOUNDATION. Times to time follow up of the progress of the orphans aremonitored by the implementing agency. Project Coordinators will continuously monitor the progress of the Scholarship holders under our experienced and well equipped personnel. Moreover, external supervision by the expert as well as a monitoring team will regularly ensure qualitative and planned progress of the candidates. AJMAL FOUNDATION has already accomplished a number of similar projects on its own as well as in collaboration with other organizations. Our organization consists of skilled personnel who are well accustomed to the field of education.AJMAL FOUNDATION has been giving out scholarships to more than 2000 poor but meritorious students since 2007.